Highlights of finance minister Arun Jaitley's Budget speech. New Delhi: Finance minister Arun Jaitley loosened his government’s fiscal deficit targets for the new financial year – partly as a result of unsure tax revenue and partly to step up public spending – while presenting a budget that appeared to focus heavily on the agriculture and health sectors. While the fiscal deficit for 2017-2018 has gone up to 3.5% of GDP from the earlier target of 3.2% the NK Singh committe’s reccomendations for the target for 2018-2019 of 3.3% have been accepted. Jaitley also listed the promises the Narendra Modi government has made in the last four years, and how the government has achieved them. 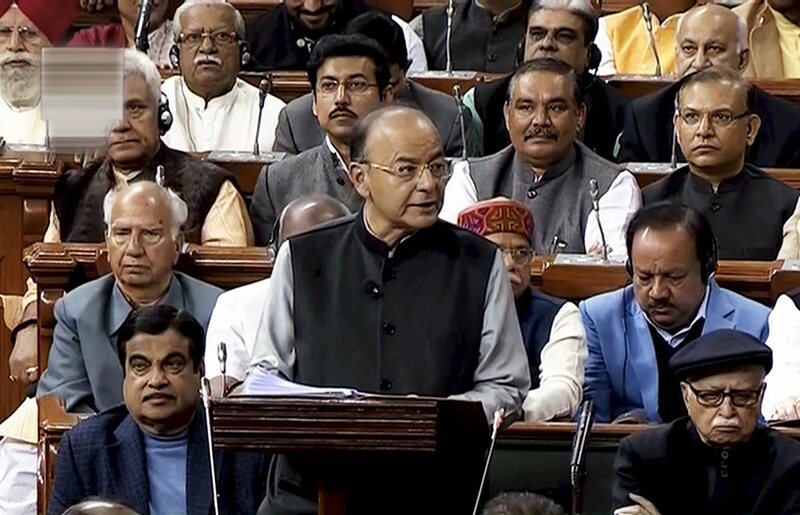 This year’s Budget, the finance minister said, will focus on agriculture, rural economy, health and infrastructure to increase the ‘ease of living’ for India’s poor and middle classes. The finance minister presented the Budget using both English and Hindi. Fiscal deficit target: The Modi government has allowed for some fiscal slippage. 3.5% for 2017-18 (target was 3.2%) and 3.3% for 2018-2019 (target was 3%). Agriculture spending: Increase in credit targets, new ‘Operation Green’, 1.5% times MSP for kharif crops, new policies that will address procurement, demand and forecast. Health coverage: Many new schemes announced, one of which is a health protection initiative that the Modi government boasts is the “largest government funded programme” in the world. India Inc: Corporate income tax rates reduced for MSMEs that have Rs 250 crore. Jaitley partially takes another step towards fulfilling his promise of reducing rates for all companies by 2019. “My government is committed to the welfare of farmers… My prime minister gave the clarion call to double farmers’ incomes by 2022. We consider agriculture to be an enterprise and want farmers to produce more on the same land and also get better returns from their produce,” Jaitley said. The minimum support price for kharif crops will be set at 1.5 times the cost of production, the finance minister said. Jaitley announced that institutional mechanisms to develop appropriate policies for prices, demand forecast, use of future/options market, expansion of warehouse system, and specific measures for export as well, will be worked out. Rs 2,000 crore has been set aside for development of agricultural infrastructure in 585 APMCs. The finance minister said the government will now launch ‘Operation Green’, which will promote farmer producer organisations and agri-logistics associations. “I propose to allocate Rs 500 crore for this purpose,” Jaitley said. The target for agricultural credit was set at Rs 11 lakh crore – up from Rs 10 lakh crore last year. A special mention was made of the high levels of pollution in the Delhi-NCR region in this year’s Budget speech. A special scheme will be implemented to support the governments of Haryana, Punjab to subsidise machinery required for crop harvesting, Jaitley said. This is to prevent crop stubble burning, a major cause of pollution in Delhi. Jaitley announced free gas connection for eight crore rural women, Rs 5,750 crore for the National Livelihood Mission in 2018-2019, Rs 2,600 crore for the Har Khet Ko Pani scheme in 2018-2019, and the plan to build two crore toilets in the next fiscal year. “For creation of livelihood”, Jaitley announced funding of Rs 14.3 lakh crore from “extra budgetary resources”. This appears to be a massive project that will include a number of sectors. The details are not yet clear though as this seems quite high. It could be a combination of existing schemes. The Jan Dhan Yojana has been expanded, with Jaitley saying it will also go into insurance etc. On education, Jaitley spent some time talking about how quality can be improved. “Technology will be biggest driver in improving quality,” he said. Rs 1 lakh crore were announced in four years for higher educational premier institutes. Jaitley did not mention what this would entail or the details of the scheme. Arun Jaitley announced the ‘Ayushman Bharat’ scheme, saying that “India cannot realise demographic dividend without its citizens being healthy”. He called it the “largest government-funded health programme”. He announced two initiatives under the Ayushman Bharat programme aimed at looking at health holistically in primary and tertiary systems. Rs 1,200 crore was set aside for setting up centres across the country that will deliver on many health services while providing essential medicines and equipment. Under Ayushman Bharat health programme, “we will avert wage loss and impoverishment”. Jaitley claimed that these schemes will also create jobs for women. “This is part of moving towards universal health coverage.” Ten crore poor families will be covered by the new national health programme, according to Jaitley. Rs 600 crore to provide nutritional support for all tuberculosis patients was also announced. Jaitley announced Rs 3,794 crore to MSME sector – a large part of which has been badly hit due to the GST roll-out – for credit support and capital interest subsidy. “Online loan sanctioning for MSMEs to be started,” says Jaitley. “This will enable larger financing of MSMEs and ease cash flow challenges faced by them.” He also promised some tax relief, which he said will be announced later in the speech. The Mudra scheme gets Rs 3 lakh crore for disbursal in 2018-2019. This is the prime minister’s pet scheme for “self-employment”. This, however, will come from banks and probably not the government. “We have made an all-time high allocation of rails and roads. Provision of key linkages like coal for power, power for railways and railway rakes for coal have been nationalised,” Jaitley said. Ten tourist cities, according to the finance minister, will be developed into “iconic” tourist destinations. While railway safety was a major topic of concern in 2017, Jaitley did not focus on it much. “Enhancing Railways’ carrying capacity has been major focus of government,” Jaitley said. The railway capex for 2018-2019is Rs 1,48,500 crore. This is an increase of Rs 10,000 crore from last year. Jaitley also said that 4,000-plus unmanned crossings will be eliminated and that “Modern train-sets with state-of-art amenities are being designed”. Talking about the Modi government’s pet bullet train project, Jaitley said that an “Institute is coming up Vadodara to train people for the project”. However, he failed to mention that much of the work on the bullet train projects will be done by the Japanese, not Indians. “In 2017-2018, the central government will receive GST revenue only for 11 months. This will have a fiscal effect,” Jaitley said. A part of this shortfall will be made up through higher direct tax revenues. Jaitley quoted data on how the Modi government brought down fiscal deficit in the past. “Our government assumed office in May 2014 when Fiscal Deficit was running at a high level. We embarked upon path of consistent fiscal consolidation.” However, Jaitley broke the fiscal deficit target for 2017-2018 at 3.5% of GDP. The 2018-2019 target is now 3.3% GDP. Jaitley also announced an extension of corporate income tax reduction to companies who have a reported a turnover of Rs 250 crore. It was earlier for companies with a turnover of Rs 50 crore. Revenue of about Rs 7,000 crore will be lost because of this, said Jaitley. Seven thousand companies that have turnover of above Rs 250 crore will still have the usual 30% tax rate. He did not make any mention of income tax in his speech. “Currently, LTCG arising from transfer of limited equity shares… are exempted from tax. With reforms introduced by government, the equity market has become buoyant,” Jaitley announced. The total amount that is exempted Rs 3,67,000 crore. The return on investment in equity is already attractive even without tax exemption. Any gain in excess of Rs 20 earned after January 31, 2018 will be taxed at 10% if this share is sold after January 31, 2018. “Revenue off LTCG tax will net government Rs 20,000 crore in first year,” said Jaitley.